Household formation, or the number of new households each year, is a key economic indicator. It represents more people finding jobs, stepping out on their own and the like. It can also be thought of as a gauge of economic confidence or security. Most people do not trek out on their own — renting an apartment or buying a home — unless they feel reasonably secure in their ability to make rent or pay the mortgage. The Great Recession effectively stopped household formation in its tracks. Jobs were scare and household incomes declined. More individuals and families doubled up in apartments, fewer Oregonians got married and the birth rate fell even further. However, as the Oregon economy transitioned from recovery to full-throttle growth a couple years ago, so too did household formation. The number of new households formed across Oregon in recent years is the largest in more than 20 years. The combination of more people with a job, rising household incomes, and the return of migration flows is driving new household formation here in Oregon. 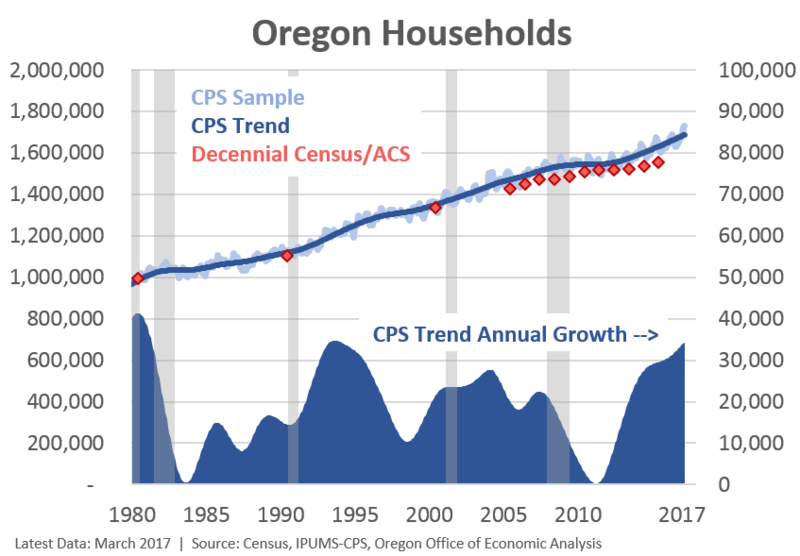 Note: The chart below shows the number of households in Oregon from both the monthly Current Population Survey which has a small sample size and, where possible, the decennial Census and American Community Survey, which have much larger sample sizes. In recent years the CPS shows more households than the ACS and the gap is growing somewhat. As such, take the latest CPS readings with a grain of salt as they may overstate the household growth to some degree. However, we do know population growth, as reported by both Portland State and Census, has accelerated in recent years. Household formation has too, the question is to what degree given the differences in the available data. Overall this is great news for the Oregon economy, and the housing market in particular. Or at least it has been historically. A growing economy and population leads to more households, driving demand for housing units and household furnishings which leads to more new construction. More new construction leads to more jobs and wages, and a reinforcing virtuous cycle ensures. However, new construction hasn’t kept pace this cycle. 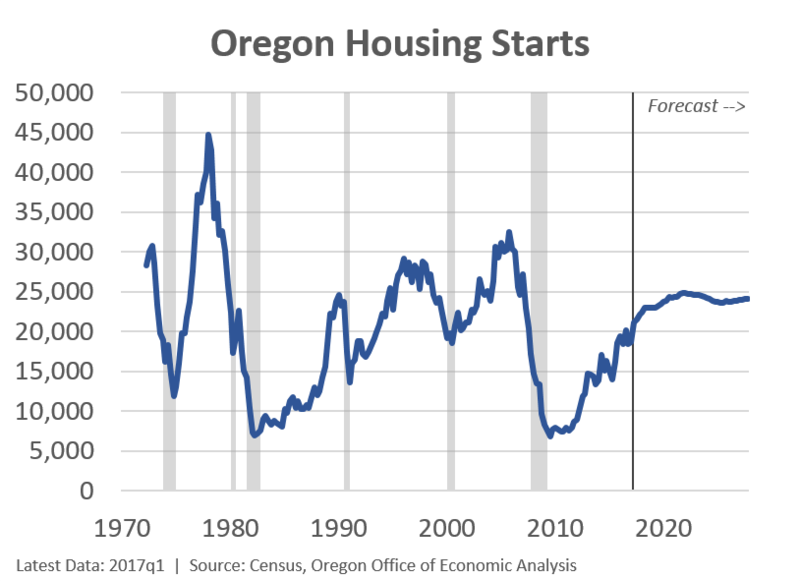 In recent years, household formation in Oregon is around 30,000 per year but housing starts are totaling just under 20,000 units per year. Now, a temporary mismatch between supply and demand is to be expected. Demand can change overnight, and certainly does with the business cycle, however supply cannot. It takes time for builders to find a property, get financing, get permits, and build. However the supply side of the market usually does get going and tends to overbuild somewhat (at times a lot). The fact that we haven’t quite reached this stage of the housing market yet is what has many economists worried. Lack of supply and the reasons why, are the fundamental drivers of the tight housing market today. That said, there is a case to be made that multifamily construction in Portland’s urban core is now sufficient to hold down rents, even as total construction remains at low levels relative to population growth and household formation. The same cannot be said for other parts of the state just yet. In terms of the outlook, our office expects some moderation for the tight housing market in the coming years for at least three reasons. First, new construction will continue to increase. Vacancies are low, prices are rising and so too is demand (household formation). Market conditions continue to be supportive of new construction. That said, we do not have robust housing start growth built in. However, another couple years of solid gains is to be expected. Second, population growth, and therefore household formation, will slow. There is a clear statistical relationship that population growth follows trends in employment. 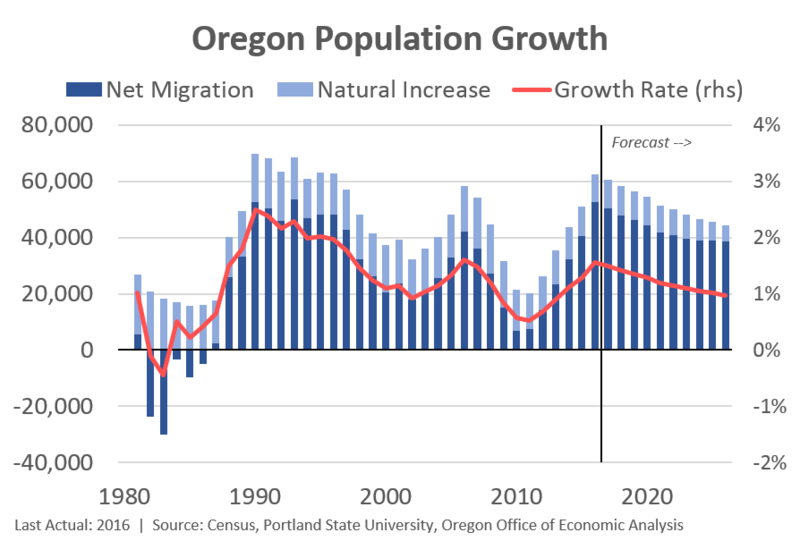 The full-throttle economic growth here in Oregon a couple years ago meant that population growth ramped up as individuals and families moved in search of those more-plentiful job opportunities and our high quality of life (see the Housing Trilemma for more). Now that the economy is slowing, transitioning down to a more sustainable rate, so too will migration flows. In fact, according to our friends at ODOT, the number of surrendered driver licenses at the DMV has already peaked, which traditionally has been a very good leading indicator for population growth. Third, when it comes to the housing market and affordability, household income gains are beginning to make a difference. Income growth for those in the middle and bottom part of the income distribution is picking up. While affordability has yet to improve, it has stopped getting worse for many Oregonians. Continued increases in new construction, coupled with slowing population gains and rising incomes are the ingredients for improving housing affordability in the coming years. We are not there yet, but between now and the next recession, that is what our office’s baseline outlook contains. Stay tuned, later this week I will have an update on Kids in the Basement, or the share of young Oregonians living at home.